Ashton Kutcher, Don't Be a Twitter Quitter! Usually web-savvy actor Ashton Kutcher says he will hand the keys to his Twitter account to a management team. Want to know how to really screw up on Twitter? Hand over management of your account to a third party. By now you’ve heard about the Twitter firestorm set off by Ashton Kutcher after his unfortunate, uninformed tweet about the firing of Pennsylvania State University football coach Joe Paterno — a quick blast that earned him the immediate wrath of the Twittersphere. “How do you fire Jo P? 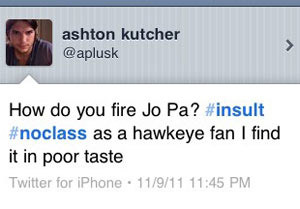 #insult #noclass as a hawkeye fan I find it in poor taste,” Kutcher tweeted late Wednesday night, in a message that’s he’s since deleted. Apparently Kutcher hadn’t heard of the child-abuse scandal that took down the Penn State gridiron great. Some of his followers had, and they tore into the actor. That led to his announcement Thursday that he would henceforth filter all his tweets through his management company, Katalyst. With this switch, Kutcher joins a long list of celebrities, from Miley Cyrus to San Francisco Giants hurler Brian Wilson, who first embraced Twitter, then backed away — or in some cases ran away as fast as their legs could carry them. Maybe it’s the rigorous demand of tapping out 140-character updates; more likely it’s the internet flamethrower that high-profile tweeters can face if they say something stupid. Plenty of other celebrities have gone the sock-puppet route. But farming out his tweets to handlers won’t “ensure the quality” of Kutcher’s Twitter feed. The move goes against the very nature of what makes Twitter so powerful, stripping away the urgency of the messages and probably neutering them in the process. By giving up control, Kutcher is severing the direct line Twitter gives him to his 8 million followers. 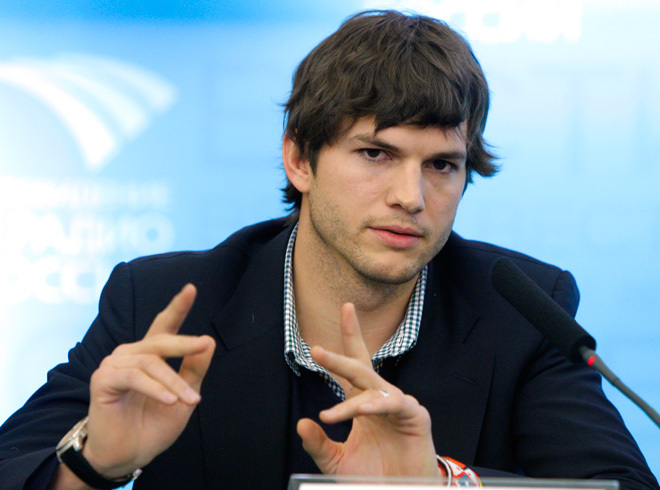 From this moment forward, his every tweet becomes a cipher: Did Kutcher really say that? Or was that a calculated statement cooked up by a marketing specialist? It’s easy to see why Kutcher fell into this trap. It’s easy to see why Kutcher fell into this trap. Twitter has been very, very good to him. The actor, who got his start playing lovable dufus Michael Kelso on That 70’s Show, has ridden his Twitter popularity to new heights, becoming an internet celebrity, a Silicon Valley investor and now the star of Two and a Half Men. Perhaps Kutcher should take a page from the media whirlwind whipped up by Charlie Sheen, the actor he replaced on the CBS sitcom. Sheen’s star power went supernova earlier this year precisely because of the unfiltered nature of his very public outbursts. Sheen was a train wreck for sure, and ended up getting fired, but his “winning” approach to communication was undeniably raw and unfiltered, and that’s what drew fans to the flame of his celebrity. People can spot a phony a mile away, even online. Or maybe especially online, where the truly awesome power of instant global communication can rip down the veil between savvy members of the celebrity class and the rest of us commoners. Installing a management team as a tweet-buffer between you and your fans will not work. Better to quit Twitter altogether than to let some fast-typing phantom masquerade as your true voice.